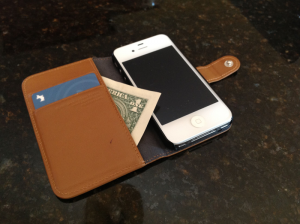 If you’re like me, the two most important things you carry with you every day are your wallet and iPhone. Unfortunately, this adds a ton of extra bulk to your pant’s pockets and can become annoying when walking for an extended period of time. If you’d like to minimize this bulk with an all-in-one solution, read on! 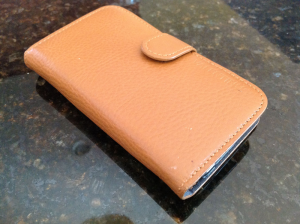 Below, we have crafted our full review of the SGP Valentinus Wallet case from Spigen SGP, which is an iPhone case fused with a faux leather wallet. To start, the SGP Valentinus case is a folio style case for the iPhone 4/4S. It features a faux leather exterior and a plastic insert which houses your phone. I like this because it provides stellar drop protection for your iPhone as the rigid plastic prevents cracking if dropped on the side, and the leather prevents scratching if placed on a table. In general, the folio style case provides super protection as it covers up your entire phone. The faux leather exterior also looks quite classy as it accurately represents real leather by using a similar material and scent. However, this doesn’t go without flaws–the faux leather material on the Valentinus tends to crack around the edges of the case where the case folds over. While this may be a minor issue to some, I think it makes the Valentinus look and feel cheap. As these cracks could become more pronounced thereby making the case unattractive over time, this issue should definitely be addressed! One thing that makes the SGP Valentinus case stand out from other folio style wallet cases is the fact that it has a camera cutout. The cutout doesn’t suffer any “flash back” issues which definitely makes this case a great choice for mobile photographers. The actual wallet part of this case is decent. It has room for two credit cards and a few bills or receipts in the hidden cash pocket. However, I would have liked to see an ID window, as this is an important function for those who need to flash an ID card at a moment’s notice. While I do enjoy using the Valentinus case on a day-to-day basis, I cannot fully recommend it. This is because of the cracking which I have experienced when using this case. While this would be less of an issue if the price was lower, the Valentinus currently sports a retail value of $54.99. If I’m paying upwards of $50 for a case, I definitely expect perfection! 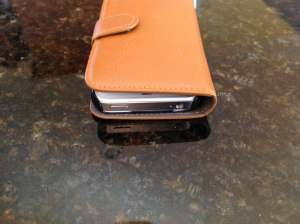 That concludes our review of the faux leather SGP Valentinus case for the iPhone 4/4S! If you would like to buy this case for yourself, head over to Spigen SGP’s website. Disclosure:Spigen SGPkindly sent out this review unit free of charge.